Reuters Mobile News Service | BlackBerry Blast! Reuters has launched a mobile news service in the UK and US. 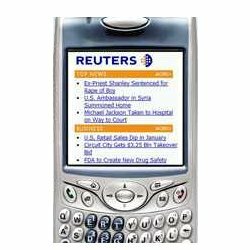 Users can get Reuters headlines straight from the source on their phone or PDA. Download the top 10 news stories, accompanied with full color photos, are continuously updated so you can keep up-to-date on the news making headlines. To get this FREE service, simply go to mobile.reuters.com on your mobile phone.